Purchasing a new shed can be a stressful time unless you understand what is available to you and what best suits your needs. In this article we will go over the three different types of material in sheds that are currently available – wood, plastic (also referred to vinyl or resin) and metal sheds. All three of these materials have their pros and cons so below we will go into detail about each. This will help you make the best choice in which type you decide to purchase. You might already have a preference in mind between wood vs metal vs plastic sheds but are just not sure on what fits your needs and budget. I should mention that I have my recommendation at the end of this article, so I do suggest you read through this information to make the most educated decision you can. Which Shed Should You Buy? Wooden sheds are the first type of shed ever built and are still going strong. The wood used for the frame is typically spruce or pine. You can purchase wood sheds made out of Douglas fir or Cedar as well. However, this will be more expensive. The walls and roof are mostly made with wood sheathing or plywood. Depending on what model you purchase, it might come with a siding made from either wood or vinyl. If there is no siding, then you will want to seal the exterior with paint. The great thing about painting is you can change the color whenever you choose. Wood sheds have a classic look to them. They are more appealing than other types of sheds. If you were to stand the three material types side by side, the majority of people would select the nicer-looking wood version. The roof on the shed (if not just painted) should be shingled similar to a house. The bonus is that you can match the shingles on your shed to the ones on your home if they are available. The inside floor will again be either a sheathing or plywood. Before we touch on the Pros and Cons of wooden sheds, let us go over some more features. When purchasing a wooden shed, you might have the option of getting one pre-assembled which is fabulous! Better yet, if you can afford to, have it delivered and assembled to save yourself time. Many sheds are sold as a kit which means it comes in pieces. If you have the tools and time to assemble the shed yourself, then this is the way to save a few dollars! If you have the shed dropped off on a Friday this would be a great weekend project, as it will likely take you a couple of days to assemble it. If you are already skilled in carpentry and have some help, it is possible to put one together in a day. As mentioned previously, you should shingle your shed (if possible, but not required) if you want to ensure it is weatherproofed. To improve this waterproofing, I would recommend installing eavestroughs, so the water runoff from the roof is kept further away from the wood, helping to prevent rot. Making sure you have a good coat of paint on the shed will also help. Touching up the paint as required is recommended as well. This will also help with snow resistance as well. If you purchase a shed made out of cedar, you won’t have to worry about insect issues as cedar is a natural repellent for bugs and insects. However, if you have spruce or pine lumber, the shed is more susceptible to rot as well as insect infestation. One positive is that you do not have to worry about a wood shed rusting like you would with a metal shed. Something I think that is important in an outdoor shed is to have the option to customize. With a wooden shed, you can add shelving quite easily if you need to. Securing shelves to the shed will ensure you have a solid and reliable structure for weight. Extra shelving is always great to have! Since it is a wood frame, you can also cut in an extra window if necessary or even drill holes through the shelter to run lines for solar power. If you decide to hook up a solar panel on top of the roof, this will allow you some additional lighting as well as the ability to power small tools. 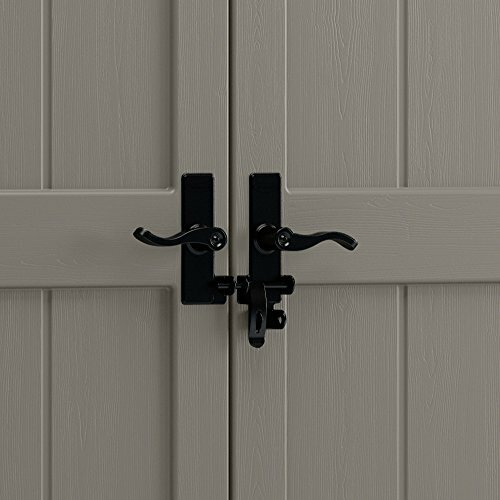 The doors on wood sheds are not always the most secure however since this is wood you are working with, you could reinforce the door it comes with or take that one out and install something more solid so that you can have a proper lock. This option would depend on your skill level. Still, on the topic of customization, I would like to include the option of adding another window. On the flip side of that, if you decide you don’t want a window, you can take it out and seal up the hole using the same wood materials and then finishing with paint, and it would be hard to tell if there ever was a window! I have also seen some nice sheds that have a window box added for flowers as well as shutters installed for appearance sake. The options are as endless as your imagination! There is not much maintenance to a wooden shed. Just ensure you are watching for insects and critters burrowing under the shed or creating nests or hives in the framing. Clearing debris away from it will help to prevent rot and as mentioned earlier, so will painting touch-ups. The durability and strength of a wooden shed are second to none when properly maintained. These sheds are quite heavy so will withstand strong winds. That being said, always securing your shed to a concrete footing is a good idea. If you are in a region where there are extreme temperatures, especially heat, you will see some paint peeling off and shingles curling up just like a house. One thing you really should be aware of with this material is that wood does burn. If you are always cognizant of that, then you should be fine. It might, however, be a good idea to install a fire extinguisher inside the shed. Before we finish this section, let’s take a look at sizing and pricing before we list the pros and cons. One of the best things about searching for a wooden shed is the many size and style options available. If you have a budget in mind, you will likely find a shed in that price range. You might not get the size you want unless you see a specific one you want, go on sale. Sizes range anywhere from approximately 20 sqft upwards to 100 sqft of floor space or larger. You can find bigger however you will pay for it! Wooden shed pricing can range anywhere from $300 to $5,000 or more. The pricing is based on materials and optional features like PVC windows. Do not forget to include the extra pricing of shingles and eaves trough. 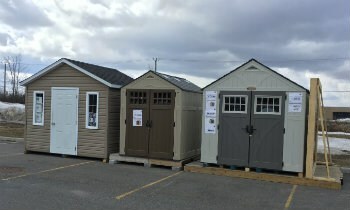 The options for sizes and pricing seems to be endless with wood sheds. Regardless of your budget, you should be able to find one that fits. Wooden sheds are customizable. Attaching shelving or other structures to the shed will not jeopardize the integrity of the structure. Out of the three materials mentioned in this article, wooden sheds are the most visually appealing. It should be no surprise that wooden sheds are structurally more solid than other options. These sheds can and will rot if you do not take proper care to prevent rotting and weather damage. You will pay more for a wood shed compared to the other materials. You might have heard the term vinyl or resin sheds and thought they are all the same material; if you thought that you would be wrong! For this article, we will discuss them together. Plastic sheds are made from either polyethylene or vinyl. Something to keep in mind is that vinyl sheds are fire resistant, whereas other types of plastic sheds may not be. It is important to check this out when purchasing. Unless you are a plastic expert, it would be difficult to tell the difference between vinyl and plastic sheds. Plastic sheds are gaining popularity since they are easy to construct and install and are highly durable, especially the vinyl versions. Vinyl sheds are more weather resistant and less likely to crack than plastic. It is important to note that the vinyl material will withstand extreme temperatures better than a plastic polyethylene. Therefore, if you live in a tropical region, your vinyl shed will tolerate wet weather conditions. As far as extreme winds go, a plastic shed will not tolerate them as well as a wooden or metal shed. It is plastic, so it is quite a bit lighter than a wooden shed, and therefore not able to withstand high wind. Plastic sheds will withstand water and snow much better than their metal and wooden counterparts. There is no need to worry about rusting or rotting with plastic. There is also no need to be concerned about insects boring into its structure. Plastic sheds are probably the easiest to assemble. All of the pieces will either snap or screw together with pre-drilled holes. You can expect to be able to setup and install one of these sheds in as little as an afternoon. Plastic sheds have a very ‘cookie cutter’ look to them. They do not have that classic shed look like a wooden shed. That is not to say you can’t find one that will fit your esthetic needs. Plastic and vinyl sheds do not require painting and are often a single color. Wooden sheds, however, can be painted to suit your individual preference. Over time, if the shed is in full sunlight. It will fade in color. That being said, plastic sheds are maintenance free, other than cleaning. It is simply a matter of hosing down with water and dish soap and wiping off the excess, if necessary. Customizing a plastic shed is not an easy task. The walls, as durable as they are, are not able to have wood shelves attached to them as a wooden shed. They are not strong enough to support the weight. If you drill through the plastic, you will weaken the integrity of the structure. Most plastic sheds are now being manufactured with double-layer walls to help strengthen the shed as a whole. Locking a plastic shed is mediocre. The sheds are rigid, and the doors close quite easily, but the type of lock may not prevent access. It would make some noise if broken into, although not as much as a metal one would. It might be enough to deter theft. For pricing and sizing there seem to be more options available every year. The sizes of plastic sheds are starting to mimic the wooden versions (20 sqft to 100 sqft or larger), so you may find a plastic shed just the right size for you. The prices range from $400 to upwards of $4,500. You could spend more, but you probably wouldn’t need to. Setting up the shed is very easy, regardless of your skill level. Metal sheds became popular in the 1960s, almost 60 years before plastic sheds. Metal sheds come in different gauges of thickness. Usually the bigger, more expensive sheds will have a thicker metal. These sheds are very basic. Even though they are straight forward, you will need to put aside a day to assemble one of these, unless you have experienced help for the set-up job. The skill level for putting one of these together would be intermediate. You do need several tools for set-up. They are not as difficult as wooden sheds to put together. However, they are a bit harder than putting together a plastic shed. Metal sheds are heavier than plastic so they are better able to withstand strong winds. You will need to ensure the shed is secured to a base. Metal sheds are very solid structurally and will last for many years if taken care of. Some metal sheds are guaranteed to last 25 years which is a lot longer than a wooden or plastic shed. Rain and snow will not be a problem for a metal shed. If there is extreme cold or heat in your area, a metal shed will do just fine, assuming you have prepared the surrounding area, so water and snow do not sit against the structure and it is off the ground. If you live in a moist region, you could have problems with rusting. If you do find rust, make sure you treat it ASAP before it spreads. You will find holes in your shed otherwise. Alternatively, if you live in a hot, dry region, a metal shed will last a very long time without rusting issues. The one great thing about metal is that you do not need to worry about it rotting or having insect infestation problems, unlike its wood counterpart. Durable and strong it is also not a fire hazard. Most people do not paint metal sheds. However, you could spray paint a metal shed with a rust-oleum brand paint or any other brand made specifically for metal surfaces. You might have to give it a light sanding first. If you decide to paint, be prepared to do touch-ups every so often (probably every two to three years). Customizing a metal shed is difficult. It is easier to put free standing shelves in than drill holes in the metal and secure nuts and bolts to hang shelves. Once you start drilling holes into a metal wall, you are creating points of entry for moisture. You’re also not likely to cut out a window either. Working with cut metal edges can be dangerous due to the sharp edges. Maintaining a metal shed is similar to that of a plastic shed. It is easy to clean and spray down when required. There is very little maintenance to do! One thing I like about metal sheds is how secure they are. It is metal, so if you have a solid lock on the door, it is very unlikely someone will be able to gain access. Finally, metal sheds come in a variety of sizes but not as many options as wood or vinyl sheds. You can purchase small to large sizes with limited style options. 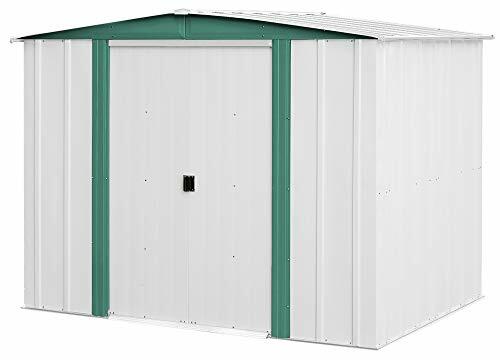 Finding metal sheds in the 20 sqft to 100 sqft range is easy and the prices are reasonable. Steel sheds are the cheapest of the three shed types. You can expect to pay anywhere from $300 to $1,500 for metal sheds. Some options are more expensive, though they are getting harder to find. I would say this is due to consumers wanting to customize their wooden sheds and the increasing popularity of the plastic models. To choose which type of shed you want, consider the following factors. Decide what your budget is, then what the main storage purpose of the shed will be. Another factor to consider might be your region’s weather pattern, as that will determine the life expectancy and maintenance requirements. 1. Determining how much you can afford to spend might trump the other factors if you have a limited budget. Metal sheds are cheaper vs wood sheds. They are also less expensive than plastic sheds. Plastic sheds are higher in price than metal sheds but have more options. Wooden sheds run the full range of being reasonably priced to very expensive (for larger sheds). 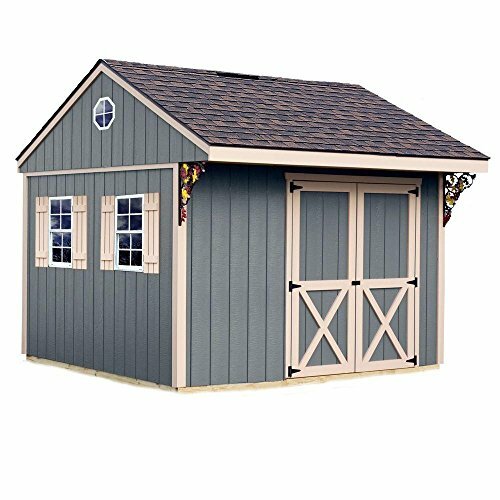 With wooden sheds you should factor in extra costs like siding or shingles if they don’t come with the shed kit. Since wooden sheds are more easily customizable and potentially expandable, the higher price may be warranted and, in the long run, well worth the money. 2. What will the primary purpose of the shed be? Are you just going to put some garden tools and bicycles in the shed or are you going to use it for storage or workspace? If the purpose is to have some outside storage and money is tight, then a metal shed is for you. If you have a bigger budget and want larger storage space, I would recommend investing in a plastic shed. If you want multi-purpose storage and workspace, then the obvious choice is a wooden shed. 3. Is weather an issue in your area? If your yard is in a windy location, a plastic shed might not be the best option. For strong winds, I would consider a wooden shed. If you live in a wet region, you might want to stay away from metal sheds and go with a plastic version. I prefer a wooden shed for both strong winds and wet regions as long as they have been properly weatherproofed and are off the ground. Now the exciting part begins! You know what to look for in a shed and what material works best for your individual needs and the climate in which you reside. With a little research and some time to peruse the hardware shops, you are sure to find the best shed that fits your budget. Good luck!